Retro cycling jerseys come in many forms. Some are retro replicas – which bring back memories of great cyclists and teams, Molteni, Merckx and Peugeot spring instantly to mind. 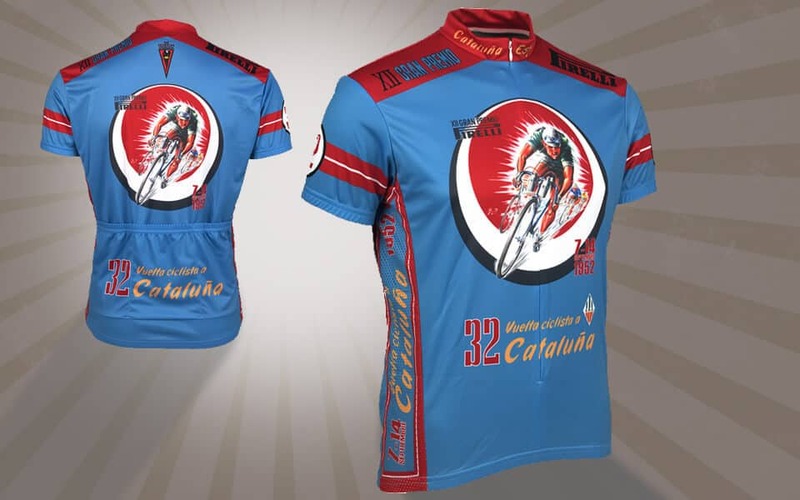 Other retro cycling jerseys such as this 1952 Vuelta Catulana jersey by Retro Image Apparel are more about enhancing a vintage or retro poster featuring a specific event and capturing it on a jersey. This transforms the print or poster into a dynamic, high performing entity for all to see. I think there is a misconception that retro bike jerseys such as these do not perform as well as others on the market. But make no mistake, these are very modern cycling jerseys – it’s just that they have a retro theme. Soft to the touch feel with odour resistant qualities. “RETRO™ true-fit” – designed to fit true to your true size. These are well vented jerseys, the fabric is highly efficient at wicking moisture away and when combined with a full length zip and 4-way stretch panels the jersey becomes very comfortable and extremely adept at keeping body odour to a minimum. There are a lot of cycling jerseys on the market which are an absolute nightmare when it comes to sizing. These are a performance club fit, you just order your typical t-shirt size for a very close fit or one up for a slightly more relaxed fit. No worries. We have had zero returns on these so far, which speaks volumes for the sizing. Retro Image Apparel have the license to print official race poster artwork. 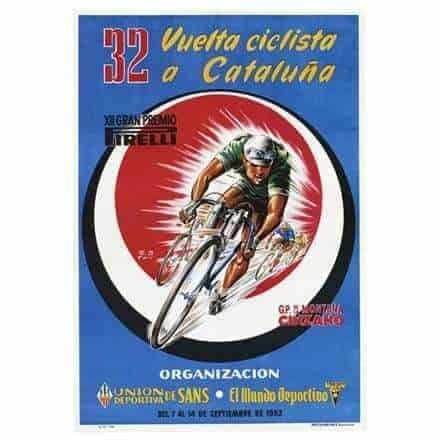 This jersey features art from the 1952 edition of the Vuelta Cataluna official race poster. That year saw a solid field of riders, many vying for a late season flash of glory. Spanish star Miguel Poblet set out to put his stamp on the race capturing the first stage at Montjuich. On the tortuous 7 hour stage between Villanueva and Geltru de Berga a duel between Poblet and Italian Aldolfo Grosso emerged. At days end Poblet had regained the leaders jersey for good. The goggles, double mounted water bottles and spare tires wrapped around the shoulders, all vestiges of the sport for many years. The print quality on the jersey is second to none, this is the main reason why Retro Image Apparel jerseys are so popular Worldwide. Stolen Goat is proud to stock this jersey and a variety of retro cycling jerseys, all of which can be found here. This entry was posted in Product Tech & Reviews and tagged blog, products, spotlight.